The "what colour is this dress?" meme is both a strange illustration of the way our brains work, and a classic case of how it is big media organisations - rather than just ordinary people - that often make things go viral. Seriously, what colour is this dress? Some see white and gold, others blue and black and others something else. Tens of millions of people have now shared their opinion online, generating one of the biggest social media conversations in recent memory. The core scientific question is: why do people see the dress in different colours? Beau Lotto, a professor of neuroscience at University College London, says: "The brain has evolved not to see absolutes, but to see the difference between things." Because colours that appear in sunlight look different from those that appear under streetlights, for example, our brains have to focus on the relationship between colours, not the colours themselves. Lotto says we can "only speculate" about why some people see blue where others see white. It could be because some are focusing on the difference between the colours of the dress itself, some are looking at the difference between the dress and the background, and others are taking the colour of their computer monitor, and the room around it into account. That's some of the the science, but it doesn't quite answer why the picture went viral at such a terrific speed. That story began just before a wedding held last weekend in the Hebrides, a group of islands just off Scotland, when the mother of the bride sent a picture to her daughter asking what she thought of the dress. The bride and groom both looked at the picture and each saw the image differently. They posted the image to Facebook, asking their friends to help settle the argument. One of them, Caitlin McNeill - also part of the wedding band - reposted the image to her Tumblr blog at around 20:00 on Thursday. "Guys please help me - is this dress white and gold, or blue and black? Me and my friends can't agree," she wrote. The post saw a flurry of activity, but she couldn't have predicted the scale of the ensuing debate. Around three hours later someone at Buzzfeed picked up on the blog, reposting the picture and a snippet of the conversation, along with a poll asking readers what colours they saw. The article set the internet alight, and has now been viewed more than 24 million times. 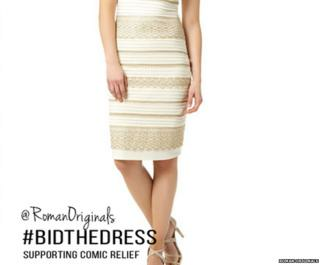 By monitoring the use of the phrase "white and gold" on Twitter, it's possible to get a rough idea of how the conversation developed. This graph shows the discussion picking up very slowly when the Tumblr blog was published at around 20:00. It wasn't until the Buzzfeed article was published just after 23:00 that use of the phrase exploded. At around 01:00, an associated hashtag - #thedress - emerged, and has maintained a consistent presence ever since. So is this a story of social media empowering the individual, giving ordinary people access to a global audience? Not quite. Really, it was old-fashioned media competition that drove the viral trend. The dramatic spike in conversation took place only in the wake of the Buzzfeed article. Its popularity on that site prompted a string of copycat articles on the news sites belonging to more established brands, as media outlets bid to exploit the huge spike in web traffic. The dress is a classical optical illusion, and that's why people love it. But it was big brand publishers getting in on the act and writing about it - kind of like the blog post that you've just read - that made it go viral.